"Four hundred miles off the Grand Banks of Newfoundland, nearly 3 miles below a restless surface, this ocean holds its most famous prisoner: the RMS Titanic." Most everyone is familiar with the tragic story of the supposedly unsinkable Titanic, and its ill-fated encounter with an iceberg in April of 1912. As with any tragedy where a substantial loss of life occurs (in this case 1500 people), the level of human interest in the story can be great. James Cameron's 1997 mega-budget film (you heard of that one, right?) 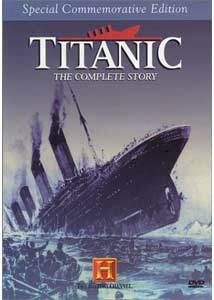 served as a catalyst to re-ignite interest in the doomed ship, and prompted this 2-disc set from A&E, which is a ponderous, overlong recitation that will only appeal to those steeped deep in Titanic lore. With a total run time of just under five hours, this history lesson is daunting in its length, and is padded slightly to enhance its own importance. Disc one features a pair of 90-minute documentaries (Death of a Dream and The Legend Lives On) produced in 1994, while disc two consists of a post-Cameron, 1998 documentary entitled Beyond Titanic. Disc one includes two features narrated by David McCallum, totaling over three hours, and it plods along a painfully dull path. Offering far too much information that is only marginally important, the content here is textbook stiff. Of mild, passing interest are the comments from actual survivors, but their input is minimal. The first installment begins with the building of the great ship, and concludes with the sinking in the North Atlantic. We learn unneccessary facts about marginal characters and passengers, and the whole thing seems to take forever to get to the maiden voyage. This opens with events immediately after the ship sank, through Senate hearings to find someone to blame. The second half concludes with Robert Ballard's search and discovery of the wreckage. It seems that these two films would have been better served had they been condensed, as the material seems padded with numerous side stories that appear as filler in order to stretch the run time. This 1998 production, narrated by Vic Garber, explores the cultural phenomenon surrounding the ship, and recaps what is referred to as the "Titanic Mythology." Beyond Titanic treads on some of the same ground as the disc one content, but focuses more on the modern day fascination. Discussion of the odd Titanic: The Musical, as well as Cameron's blockbuster round out the piece. Image Transfer Review: Both discs are presented in 1.33:1 fullframe, as they were when originally broadcast. Most of disc one consists of closeups of black & white photos, but the occasional color interview segments look fairly bright. Disc two has far better color balance, with richer, more natural hues. Audio Transfer Review: The 2.0 digital stereo tracks are very clean, with surprisingly rich, deep bass. Narration is clear, and mixed well above the score. Obviously there is not much in the way of dramatic imaging, but the soundstage (especially on disc one) is fuller than most stereo tracks. Extras Review: Who would expect ANY extras on a nearly five hour history of the Titanic? I mean, what's left? Disc one includes a timeline, which covers key events from 1867 to 1912. Disc two includes a brief manifest of key passengers, as well as a seven-screen text document entitled Essay: The Titanic in Pop Culture, in very tiny print. Each of the three documentaries are split into 12 chapters each. Unless your interest in Titanic history is strong, this 2-disc set will serve as a digital sleeping pill. Dull, overlong and far too detailed.